National Day Nurseries Association (NDNA) picked up a national award for its new website. The ASI 2015 Great Things Award was given to the Huddersfield-based charity for its IT and website project’s vision and subsequent delivery. Anne Naylor, Director of Finance and Support Services, and David Bagley, IT Project Team Lead, collected the award at the ASI Annual Conference in London. Using iMis software and with partners iFinity, NDNA developed its exciting new website integrated with a customer engagement management system to engage better with more than 5,000 members in England, Wales, Scotland and some worldwide. Anne said: “We listened to our members and included their input into the project, which has taken just over a year to complete. “Since the project went live in May, we have received extremely positive feedback from our members. It has enhanced our offer to our members and other customers, which includes myNDNA, a free online community for the early years sector, and made the charity’s business processes more efficient. Photo caption (from left) Natasha White, Glenn Rothwell, David Bagley with the award, Charlotte Vevers, Anne Naylor, Sabhar Nazar, Abigail Turner. 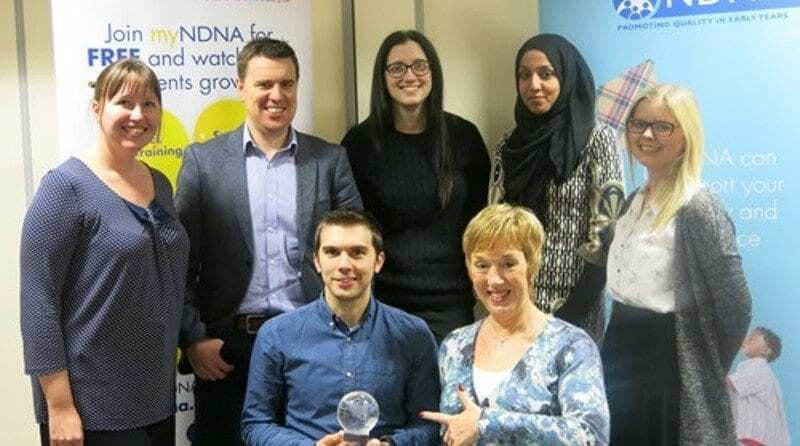 NDNA is a national charity representing children’s nurseries across the UK, giving them information, training and support, so they can provide the best possible care to young children. NDNA is the voice of the sector, an integral part of the lives of nearly one million children and their families.